Power A, the people who made the Xbox 360-style controller for the PS3, just miniaturized the Wiimote and Nunchuk and are releasing it in one package. It's 35% smaller than the standard Wiimote, but actually feels more natural. The MiniRemote and MiniChuk comes in one $50 package in black, purple, pink and teal. It has larger A, 1 and 2 buttons, a better speaker, a more contoured back and standard compatibility with WiiMotionPlus and other third-party addons. 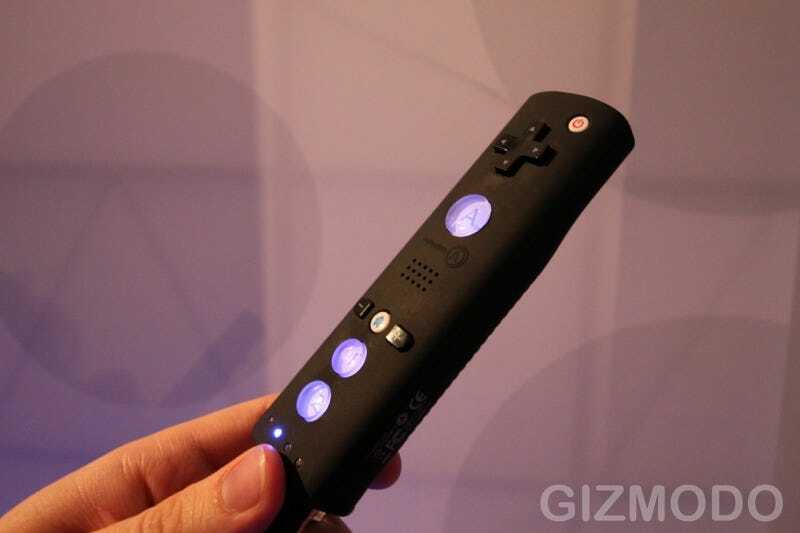 The smaller body felt great when we were playing with it, and going back to the real Wiimote actually felt awkward. The MiniRemote is more balanced as well, which is better when you're playing something in horizontal mode like New Super Mario Bros. I asked Power A whether or not they could possibly put the Wii MotionPlus accessor into the actual remote so you don't need to get yet another addon. They said it was theoretically possible, but they're not doing it yet. Perhaps next year!